The new feature to password protect Notes on iPhone and iPad was introduced in the iOS 9.3 update. This allows you to protect Notes on your iPhone containing personal or sensitive information with a password within the Notes app. In addition to password protection, you can also lock and unlock Notes with a Touch ID on iPhones that support the Touch ID feature. Using Touch ID in addition to a password is recommended as this adds another layer of security and allows you to open password protected Notes even in case you forget the password. Follow the steps below to password protect any Note on your iPhone or iPad within the Notes App. You will be required to setup a password for the Notes app when you try these steps for the first time (Step 5). 1. Open the Notes app on your iPhone or iPad. 2. Create a new Note or open any existing Note that you want to password protect. 3. Once you are within a Note, tap on the Share icon located at the upper right corner of your screen (See image below). 4. On the action menu that pops-up, tap on Lock Note. 5. On the next window, type in a password that you want to use for protecting Notes. Confirm the password by entering it again and type in the optional password hint and tap on Done. Note: You need to set up a password only the first time. Next, time you will be able to lock any Note by just tapping on the Lock icon at the top of the screen and entering your password. You will also see a switch for enabling Touch ID, in case you have enabled Touch ID on your device. 6. Next, you will see a pop-up message, click on OK.
7. Even though you have setup a password for Notes, you still need to tap on the lock icon at the top of the screen in order to lock a Note (see image below). Once you tap on the lock icon, the Note will be locked and you will see a confirmatory ‘This Note is Locked’ message. 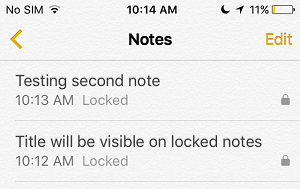 Once you have enabled a password for the Notes app, you can quickly lock down all your Notes from the Notes List View Screen. 2. Make sure you are on the screen showing a list of your Notes (See image below). 3. Tap on the Lock Now button at the bottom of the Screen to lock all the Notes on your device (See image above). Follow the steps below to view or open a password protected Note. 1. Tap on the Notes app icon to open Notes on your iPhone. 2. From the list of Notes, tap on the protected Note that you want to access. 4. On the next screen, enter the password that you had set up for the Notes App and tap on OK to view the password protected Note. Once you are finished viewing or editing the Note, you can lock it back again by tapping on the lock icon from the top of the screen. At some point you may decide not to protect a particular Note. This can be easily achieved by removing the password from a protected Note by using the steps below. 1. Open the protected Note that you want to remove password from. 2. Next, tap on the Share icon located at the top of the screen. 3. Next, tap on Remove Lock in the action menu that pops-up. The password on this particular Note will be totally removed. From now on you will be able to access this Note without entering a password. All other Notes that were password protected will remain protected and you will be required to enter your Note password in order to access these protected Notes. In case you want to, you can easily change the password for Notes app by following the steps below. 2. Tap on Notes > Password. 3. Next, tap on Change Password. 4. On the next screen, Enter the Old Password, New Password, Verify your new password, enter a Password hint and tap on Done. Note: The new password will apply to all future Notes and also to those Notes that were password protected with the old password. In case you forget your Notes app password, you can easily reset the password by following the steps below. 1. Tap on Settings > Notes > Password. 2. On the next screen, tap on Reset Password. 3. On the pop-up, enter your Apple ID password (yes Apple ID) and tap on OK.
From now on ‘Notes’ will not be password protected on your device. However, Notes on your device that were already password protected will still remain locked, they are not affected by this password reset. There is no way to access ‘Notes’ that were already password protected, you will either need to somehow remember the old password or risk losing access to those protected Notes. Below is a summary of the password protection feature as available for the Notes app since iOS 9.3. This should make it clear as to how this feature works. 1. Make sure that there is no sensitive information on the first line of a password protected Note. The first line of a protected Note will be clearly visible on the List view of the Notes app. 2. Even though a Note is locked, it is not protected from accidental or intentional deletion. A password protected Note can be deleted or moved without having to enter a password or Touch ID. 3. The password that you setup for the Notes app is not the same as the passcode for your iPhone or iPad. This password is specific to the Notes app and just used for locking Notes. 4. There can be only one password for protecting all Notes on your device, you cannot have different passwords for different Notes. 5. Since there is only one password, unlocking a Note unlocks all other Notes in the Notes app. Thankfully, password protected Notes will be automatically locked in case you lock your device or happen to force close the Notes app. 6. In case you forget your Notes app password, the password hint will not be displayed until you make three incorrect password attempts to unlock a Note. 7. When you change the ‘Notes’ password, the new password will apply to all the Notes on your device. 8. You can Reset your Notes App password. However, this does not affect the Notes that are already password protected. You won’t be able to access those Notes without remembering your password.